Google officially announced Android Wear 2.0 for smartwatches. 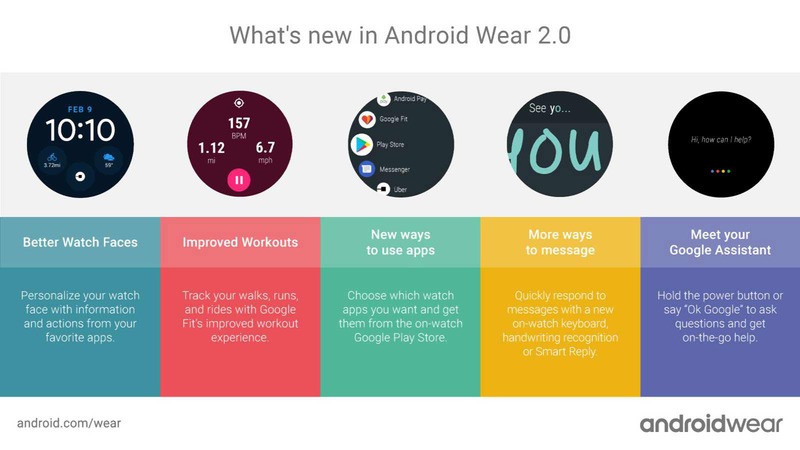 The new Android Wear 2.0 will give better workouts, new ways to use apps, more ways to stay in touch and on-the-go help from Google Assistant. Check out full features list below. You can now personalize your Android Wear always-on watch face with information and actions from your favorite apps. Simply glance at your wrist to check your next appointment, stock performance, progress on fitness goals, or whatever is important to you. A quick tap on your watch face lets you instantly order an Uber ride, start a workout, or get in touch with your significant other. Google Fit, the pre-installed fitness app on most Android Wear watches, now lets you track your pace, distance, calories burned and heart rate as you’re walking, running or cycling. You can also measure weight-lifting reps, in addition to push-ups, sit-ups and squats. When you work out with a cellular-connected Android Wear watch, you can stay in touch with calls and messages, stream tunes from Google Play Music and still use your favorite apps right on your watch. With Android Wear 2.0, you can choose which apps you want on your watch and download them directly from the new on-watch Google Play Store. If your watch has a cellular connection, you can make calls and use your watch apps no matter where your phone is. Whether you use an Android phone or iPhone, you’ll be able to use apps built for Android Wear 2.0, like AccuWeather, Android Pay, Bring!, Foursquare, Google Fit, Google Messenger, Google Play Music, Lifesum, Robinhood, Runkeeper, Runtastic, Strava, Telegram, Uber and many more. When you receive a message, you can expand the notification and tap to respond by dictating, typing or handwriting your answer, or drawing an emoji. Try it out on apps like Facebook Messenger, Glide, Google Messenger, Hangouts, Telegram or WhatsApp. Android Wear 2.0 brings the Google Assistant to your wrist, so you can find answers and get things done—hands-free. Make a restaurant reservation or navigate to work. You can even update your shopping list right from your wrist. To ask for help, just hold down the power button on your watch or say “Ok Google.” The Google Assistant is available in English and German on Android Wear and will be available in other languages in the coming months.